The following information is derived mostly from data obtained from three primary sources: The Centers for Medicare and Medicaid Services (CMS) including Medicare cost report data, California’s Office of Statewide Health Planning and Development (OSHPD) and the American Hospital Association (AHA). 1. Hospitals in the U.S. billed an average of 3-1/2 times what they received in payments for all of the services they provided in 2015. 2. The amount hospitals bill over what they receive has increased dramatically over the last few decades. Four decades ago, most hospitals billed only a few percent, on average, more than what they received in payments. 3. Very little of the care hospitals provide is uncompensated; about 2-4% on average. Deductions by Medicare, Medicaid and the insurance companies account for almost all of the differences between billing charges and receipts. 4. Even though hospitals in the U.S. are paid an average of less than 30% of what they bill, their profits margins have averaged around 8% in recent years. 5. Over 80% of hospitals in the U.S. are non-profit. 6. The proportion of a hospital bill a private insurance company pays is substantially higher, on average, than the proportion Medicare or Medicaid pays, and that difference has grown steadily since 2000. 7. Private health insurance companies deliberately overpay hospitals to ensure that their revenues continue to grow each year. 8. Hospital costs per enrollee have been nearly static for Medicare and Medicaid recipients since 2008, whereas they’ve grown by more than 60% for the privately insured. According to CMS data, roughly 32% of our total healthcare expenditures and 38% of our personal healthcare expenditures went to hospitals in 2016. Hospital expenditures include money spent toward inpatient care as well as any outpatient service provided by a hospital. Outpatient services might include anything from a routine blood test to an emergency room visit or an outpatient surgery. Though a large proportion of our healthcare money still goes to hospitals, it’s less (as a proportion) than it was in 1980 when 39% of total healthcare expenditures and 46% of our personal healthcare expenditures went to hospitals. Previous sections have shown that hospitals usually bill far more than what they expect in payments from any of the insurance providers. 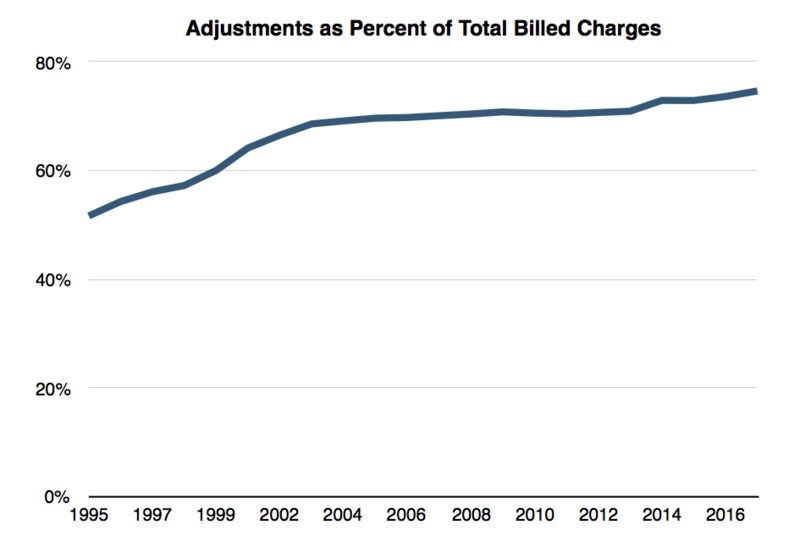 The following graphs show how much hospitals over-bill, on average, and how over-billing has evolved over the last few decades. 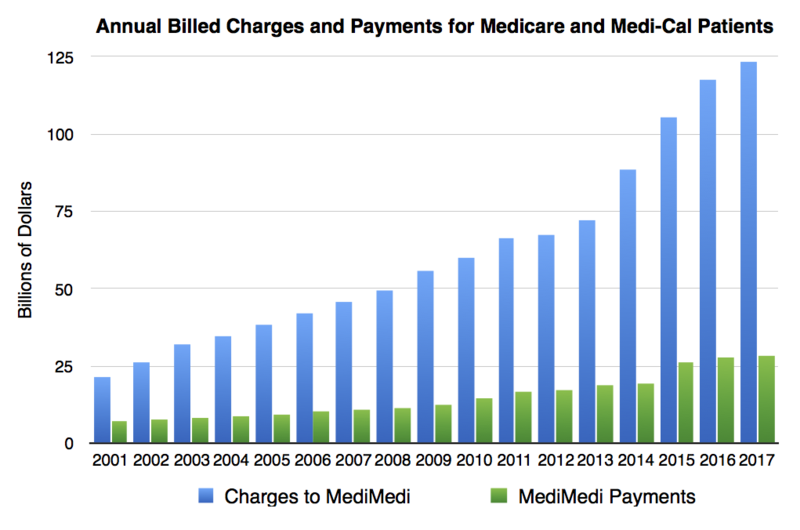 Figure 1: Medicare cost report data shows that hospital billing charges (GPR) in the U.S. exceeded payments on those bills (NPR) by less than two to one (1.76 times) in 1996. That ratio (GPR/NPR) rose to about 3.5 to 1 by 2015. 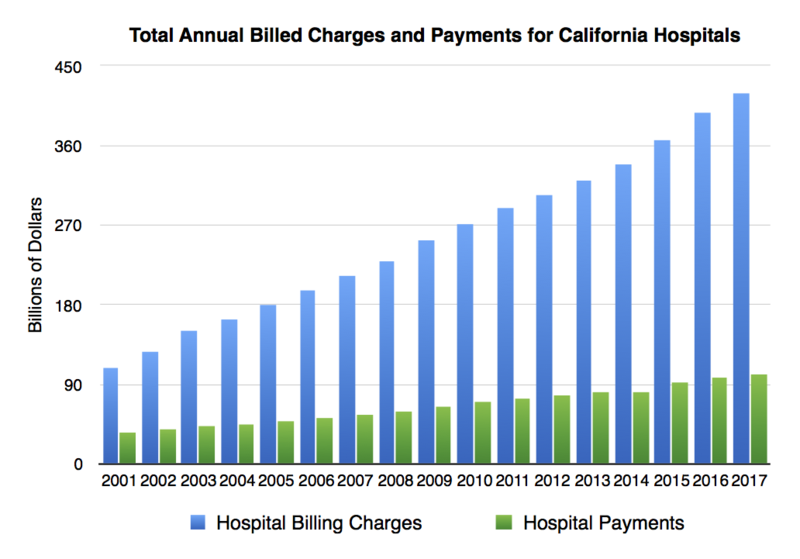 Figure 2: Data from California’s Office of Statewide Health Planning and Development (OSHPD) shows that, in 2001, hospital billing charges (GPR) exceeded payments (NPR) for all patients and services by about 207% (3.07 to 1). By 2017, GPR exceeded NPR by more than four to one (billing was 317% more than receipts). 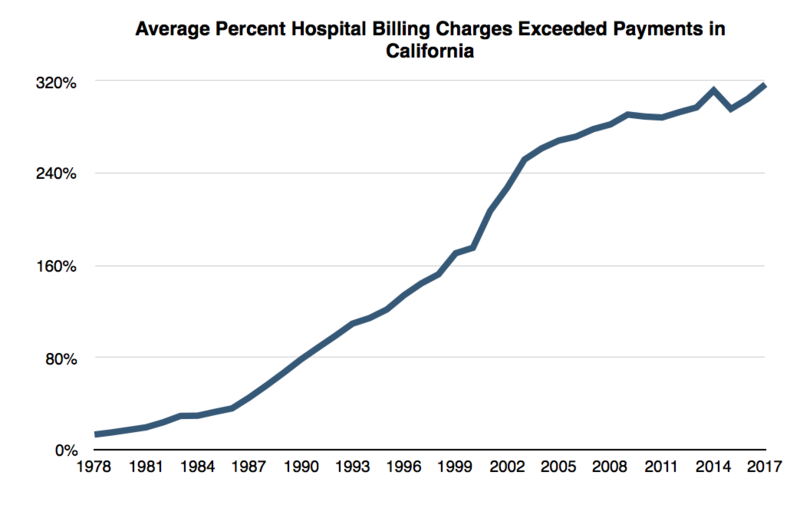 Figure 3: Data from California’s OSHPD also shows that, in 1978, California hospitals billed an average of about 14% more than what they collected (GPR/NPR was about 1.14). By 2017 hospital bills exceeded payments by more than 300% in California. Figure 4: Almost all of the difference between billing charges and payments for hospitals is due to “adjustments,” which are the discounts Medicare, Medi-Cal (California’s Medicaid) and the private insurance companies get from the hospitals. In 1995, these discounts averaged just over 50%. They averaged more than 70% by 2017. 1) Patients who require hospitalization, but have no means to pay for the hospitalization, usually qualify for emergency medicaid in most states. Emergency Medicaid can cover any patient who is uninsured and can prove that they can’t afford to pay a hospital bill, even if they don’t normally qualify for Medicaid as an outpatient. Emergency Medicaid greatly reduces the the number of cases a hospital might have to forgive as charity. 2) Hospitals are very aggressive in going after patients who owe them money. Most hospitals have collection agencies working for them and, if their own collection agency can’t collect the debt, the hospital will usually sell it to an outside collection agency. When a hospital sells a debt to an outside collection agency, they often get nearly as much on that debt as they would from most regular payers for the same service. This is because collection agencies often pay about the same fraction of the total billed charges for a hospital service as an insurance company will pay. Once the debt is sold, the agency that purchases it is allowed to go after the patient for the full billing charge. 3) Hospitals that do provide a lot of uncompensated care, such as county hospitals who treat large numbers of indigent patients, qualify for disproportionate share funds (DSH) from CMS. DSH payments can amount to tens of millions of dollars each year for hospitals that treat significant numbers of both indigent and Medicaid patients. DSH payments ensure that the hospitals that treat these patients don’t lose a significant amount of money money on these patients. Those three factors limit the exposure hospitals have to uncompensated care. According to CMS, all hospitals in the U.S. forgave only about 2.25% of their bills for charity and lost only about 2% to bad debt between 2011 and 2015. Figure 5: Hospitals account for the uncompensated care they provide in two ways: charity, in which a hospital forgives all the billing charges voluntarily, and bad debt, when a hospital can’t collect on a bill from any payer. Uncompensated care amounted to an average of less than four percent of billed charges for California hospitals in any year since 1995. Between 2015 and 2017 California hospitals lost less than two percent of what they billed to uncompensated care. Figure 6: In spite of the fact that California hospitals don’t collect most of what they bill, their profits, on average are quite robust. 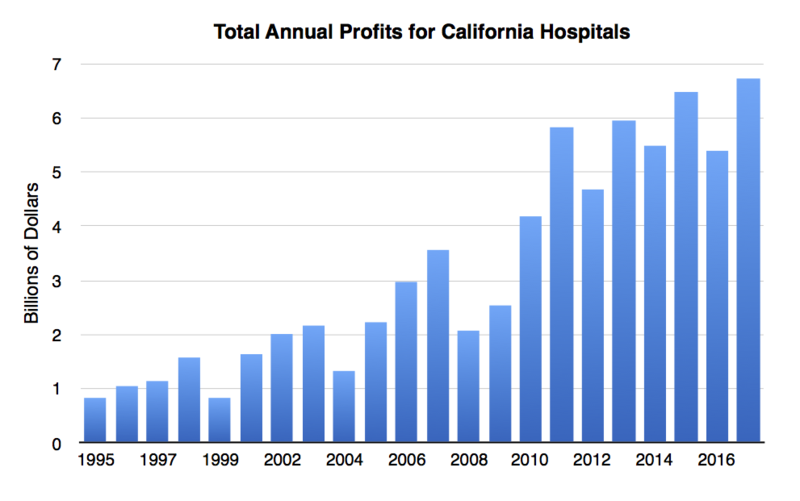 Profit margins for California hospitals have averaged about five percent each year since 1995, though not all hospitals are profiting each year and some years have definitely been better than others. Also, roughly 80% of California’s hospitals are non-profit. 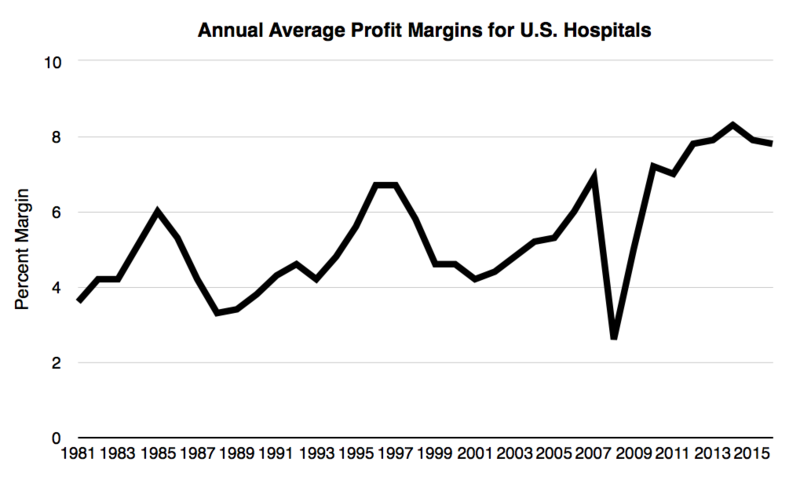 Figures 7 & 8 are from AHA data and show that hospital profit margins in the U.S. have ranged from four to six percent most years since 1981, though, in recent years, they’ve done much better. 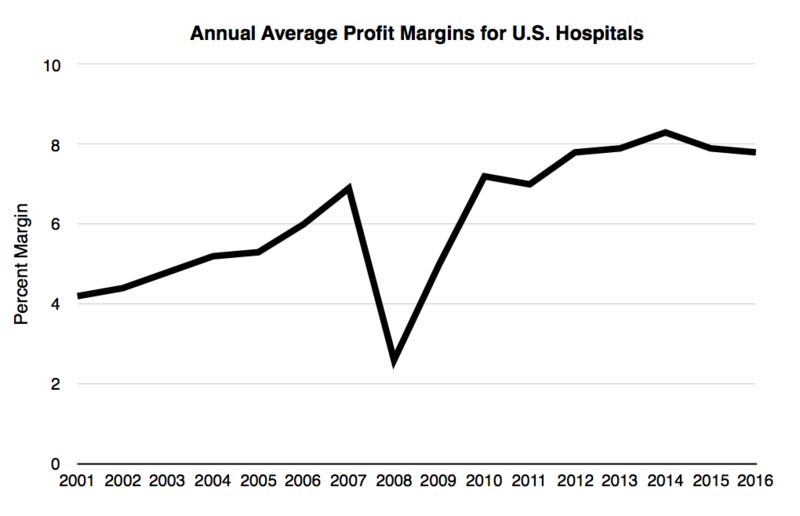 Figure 8 focuses on hospital profits since 2001 and shows that, with the exception of 2008, profits for U.S. hospitals have risen consistently during the twenty-first century. The average profit margin for hospitals in the U.S. has been around 8% since 2012 even though more than 80% of hospitals admissions in the U.S. are to non-profit hospitals. The average discount or “adjustment” each of the different payers (private insurance vs. Medicare or Medicaid) get can vary considerably. The following graphs show these differences. Figure 9: Medicare and Medi-Cal (California’s Medicaid) payments to hospitals have not grown nearly as fast as hospital billing charges. Medicare and Medi-Cal paid just over 30% of what they were billed by California hospitals in 2001. By 2017 they were paying less than 20% of these billing charges. 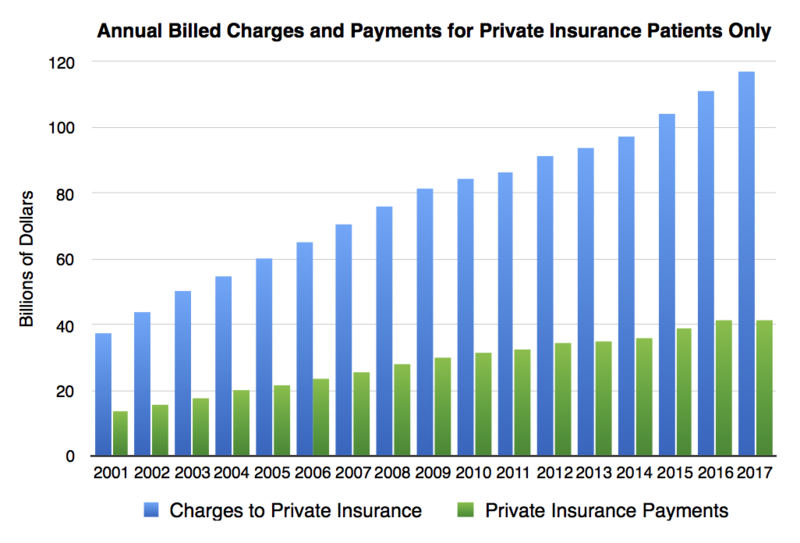 Figure 10: Private health insurance payments, on the other hand, have kept largely in step with hospital billing charges since 2001. Private health insurance companies have consistently paid an average of 36-37% of what California hospitals have billed them since at least 2001. Figure 11: Unlike Medicare or Medi-Cal, private insurance companies have paid a nearly fixed portion of what they’re billed by hospitals for most of the last two decades. The following three figures show just how much private health insurance companies have been overpaying California hospitals in recent years. Keep in mind, Medicare covers the elderly and disabled and Medi-Cal covers the impoverished and the disabled whereas private health insurance usually covers the young and employed. It makes very little sense to think that privately insured people would be more expensive to treat than Medicare or Medi-Cal recipients. 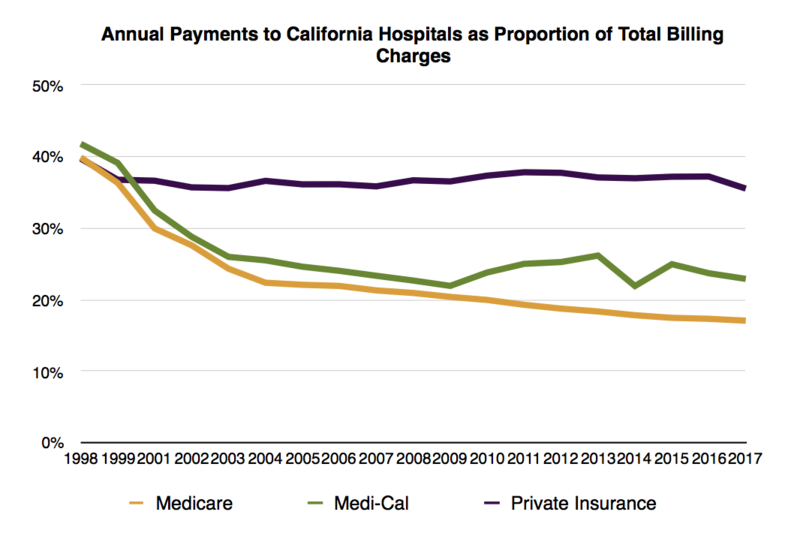 Figure 12: Average Medicare, Medi-Cal and private insurance payments each year for each patient admitted to a California hospital since 1995. 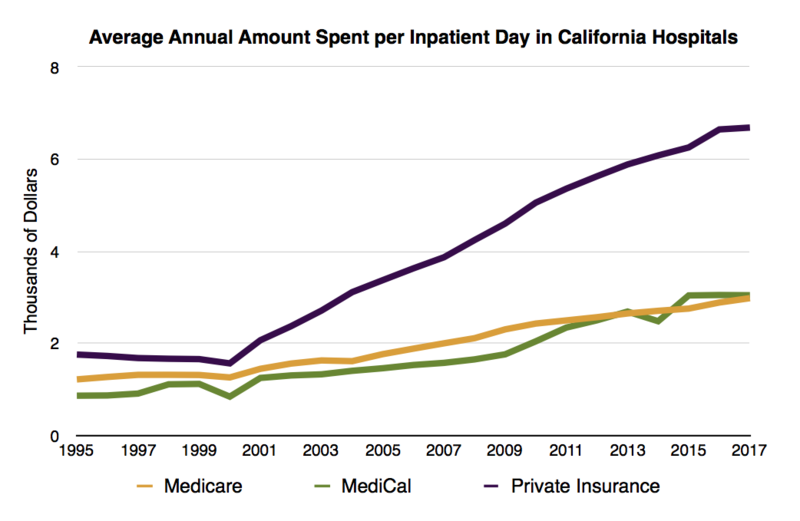 Figure 13: Average Medicare, Medi-Cal and private insurance payments each year for each day a patient spent in a California hospital since 1995. 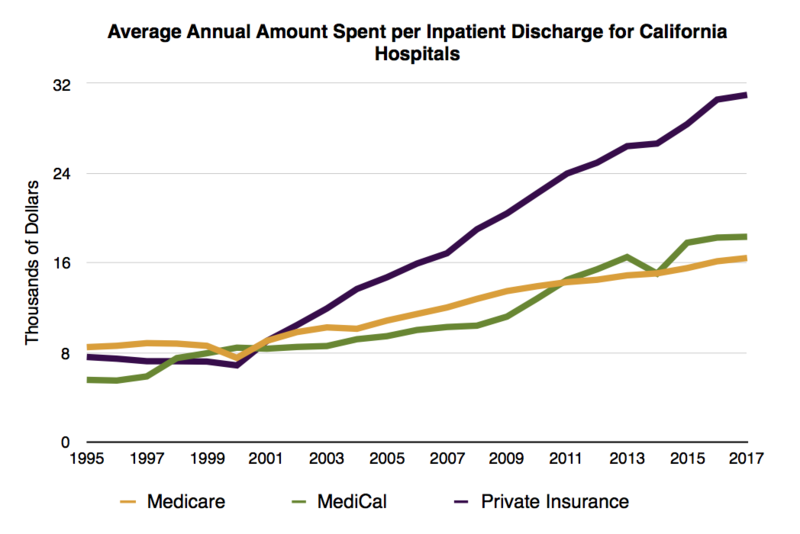 Figure 14: Average Medicare, Medi-Cal and private insurance payments each year for each outpatient visit to a California hospital since 1995. 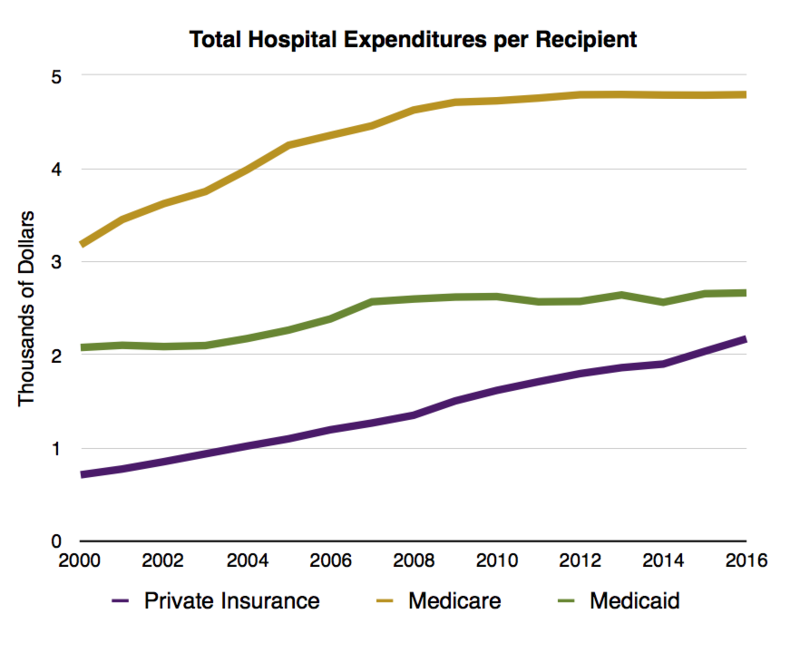 Figure 15: Between 2008 and 2016, hospital expenses for Medicare and Medicaid recipients went up less than a total of 4% per recipient. Hospital costs for the privately insured increased by over 60% during those same years. Figures 16 and 17 show a similar pattern in payments to hospitals. 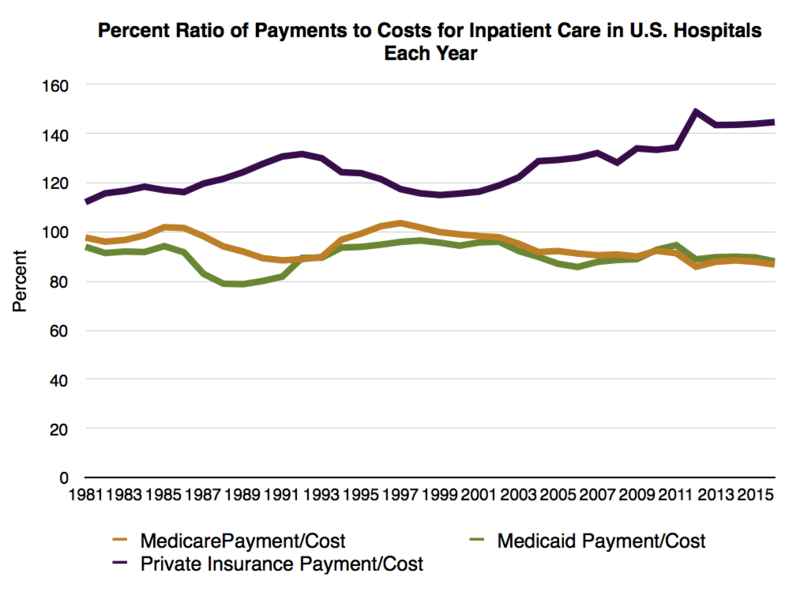 Figure 16 is from data from the American Hospital Association (AHA) and shows average payments divided by costs for inpatient care for all U.S. hospitals each year since 1981. Figure 17 is the same data, but focuses on the last two decades to make an easier comparison to figure 12. According to AHA data, private insurance companies have consistently overpaid hospitals for inpatient care for more than three decades. These overpayments have varied significantly over the years, but have grown dramatically in the past few years. Prior to 2000, private health insurance companies overpaid hospitals by an average of about 20% but, since 2000, that average has grown to 30% and been well over 40% since 2012. Also, since 2000, Medicare and Medicaid have been paying an average of 8-10% less than what it costs to take care of inpatients (according to the AHA). 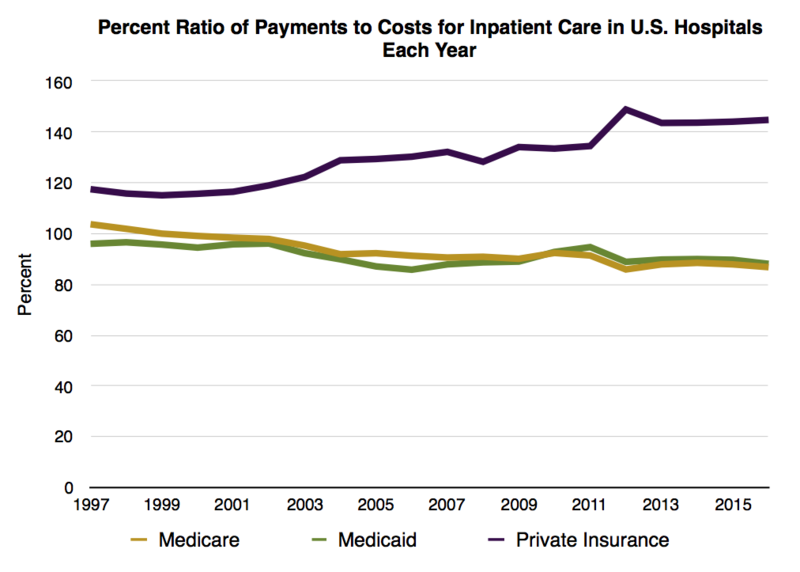 Figure 16: (From AHA data) Private insurance companies have consistently overpaid for inpatient care since 1981 while Medicare and Medicaid have, at times, paid enough for this care but often underpaid hospitals. Figure 17: The amount by which private health insurance companies overpay hospitals has grown consistently each year since 2001. How does the AHA data reconcile with the OSHPD data above for California hospitals? First, estimates about the cost of taking care of any inpatient are somewhat subjective since a large proportion of a hospital’s budget goes towards fixed overhead expenses and not towards taking care of any patient in particular. That said, Medicare covers almost exclusively people over 65 and the disabled and Medicaid covers the impoverished and the disabled. Private health insurance usually covers people who are younger and healthier than Medicare or Medicaid recipients. Because of this, hospitalized patients covered by private insurance would likely be less expensive to treat than either Medicare or Medicaid patients. According to the data from the OSHPD, private health insurance companies paid roughly the same amount (on average) for inpatient care as either Medicare or Medi-Cal paid. If the care of a privately insured patient should be less expensive (on average) than the care of a Medicare or Medi-Cal patient yet the insurance companies are paying the same amount for their care, then the insurance companies would be overpaying. So the data from the AHA largely agrees with the data from the OSHPD, they’re just approaching the issue in two different ways. 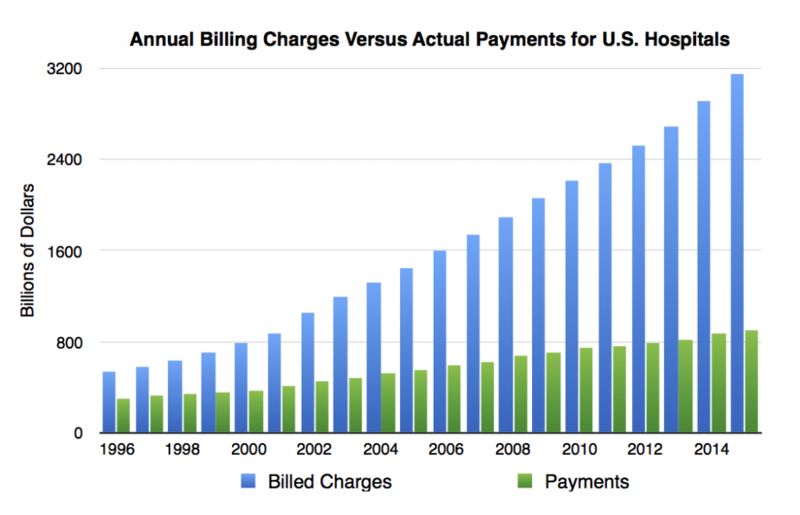 Hospitals over-bill persistently and excessively to the point where hospital billing charges have ceased to have much meaning beyond their ability to shock and frighten people. The question is: why do hospitals over-bill by so much and why is this problem getting worse each year? They don’t over-bill to make up for uncompensated care. Neither charity nor bad debt are significant financial issues for most hospitals in the U.S. Nor has the amount of uncompensated care provided by hospitals increased significantly at any time in the last four decades. In fact, since 2014, uncompensated care provided by California hospitals decreased by around 50%. 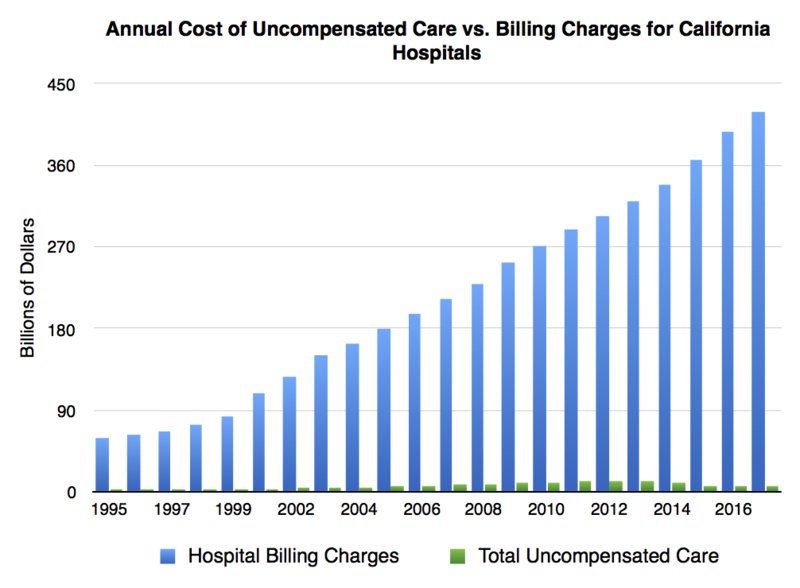 The most obvious reason hospital over-billing has increased so persistently is that hospitals can make more money by doing it. While Medicare and Medicaid control their costs by tying their payments to the actual cost of medical services, private insurance companies appear to be just paying a fixed percentage of what they’re billed. That alone gives hospitals a strong motivation to inflate their billing charges by more each year independent of their costs. Why are private insurance companies overpaying hospitals by so much each year? It’s not because they have to. The largest private insurance companies cover nearly as many people as Medicare. In fact, the largest private health insurance companies dwarf the largest hospital conglomerates in sheer size, so the insurance companies have easily enough negotiating power if they really wanted to drive hard bargains with hospitals. There are two major reasons private insurance companies have been overpaying hospitals. First, it’s not their money most of the time. Most employer sponsored private health insurance policies are covered entirely by employers who self-insure. In such cases, the insurance company only negotiates the payments, but never pays anything toward the medical bills. Since the insurance company isn’t bargaining with their own money in such cases, they have little motivation to drive hard bargains. But even when they are bargaining with their own money, insurance companies are financially motivated to over-pay on hospital bills. Why? Insurance companies can make more money that way. 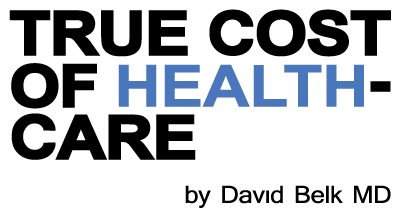 The revenue for any health insurance company is tied directly to its expenses. In other words, the more a health insurance company spends each year, the more revenue they can earn (through premium increases the next year). Therefore, the last thing any health insurance company would want is for their overall expenses to drop. If their expenses were to drop, they couldn’t justify raising (or even maintaining) the amount they charge policy holders in premiums. That would be a disaster for them. 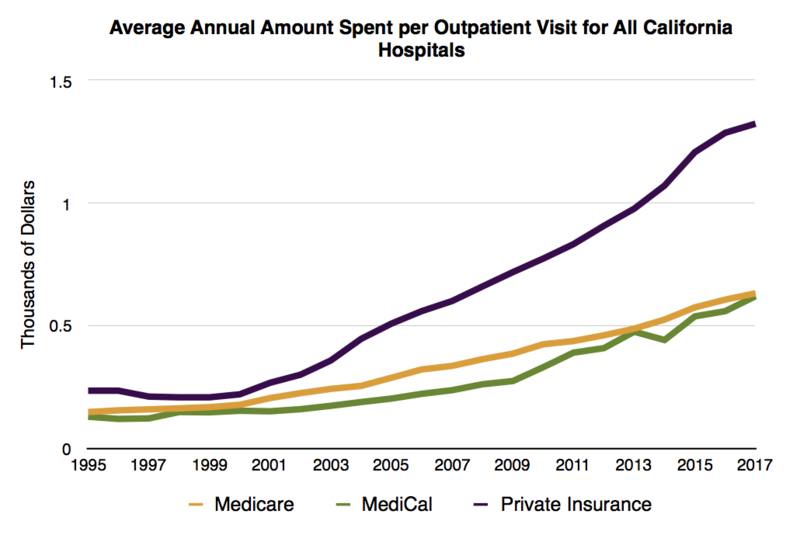 Since hospital utilization has been declining overall, it would be hard for private health insurance companies to continue to show an increase in their costs each year unless they deliberately overpaid hospitals, so that’s exactly what they do. Hospitals don’t mind being overpaid, so they’re not complaining. Since hospital bills always show enormous discounts from the insurance companies (due to persistent over-billing) most people wouldn’t suspect what the insurance companies are really doing. This way, both sides can work together to profit from our ignorance.